Loud Rage Music is a Metal label from Romania, which focuses on Romanian bands (Ashaena, Blutrina, Whispering Woods, Akral Necrosis, Ordinul Negru, The Wake and some more) especially, though not exclusively, for they did release some albums from non-Romanian acts too in the meantime (like Tragacanth and Grieving Mirth). For the better part I did write a review (enter the label’s moniker in ‘search’…). To my opinion, for what it’s worth, it’s a great thing, because the Romanian scene has a lot to offer, yet unfortunately this scene is too unknown and largely underestimated. I guess everybody knows Negura Bunget, Argus Megere, Ordinul Negru, Dordeduh, Abigail or Akral Necrosis, I guess, amongst some hands full of others, but there is so much more to explore out there. Thanks to this label, we have the opportunity to find out more interesting bands and releases. Oh yes, FYI: the label also supports some unsigned Romanian bands (like Hteththemeth, Sincarnate or Funeral Baptism), which I will come back to in the future. But a while ago, Loud Rage Music informed me about the return of this band through the release of Negativity, a seven-tracker that lasts for fifty-six minutes (the lengthy songs last in between six and twelve minutes). And after some listens, I am truly pleased by their resurrection! 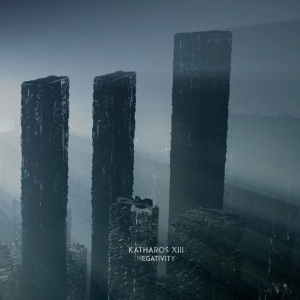 Katharos XIII perform a melancholic form of Black Doom Metal, though not of the DSBM-oriented kind (DSBM = Depressive-Suicidal Black Metal), yet closely related with several comparable elements. Their ‘melancholy’ gets translated at the one hand by the lyrics, which deal with loss, emptiness, misanthropy and pain (therefor, the title of this work could not have been chosen better! ), and by the main guitar riffs (and as result, the whole instrumentation involved, with a focus on the bass lines and the keyboard representation) at the other. Those riffs are strongly melodic and, for the better part, epic too. Besides, the several intermezzos come with a same-minded attitude. Sometimes, the excerpts tend towards a certain progressive play (especially the song constructions, translated via the (semi-acoustic) guitar melodies and, for sure, the drum parts), then again a timeless approach takes over the game. Also, and that is another aspect that differs from quite some DSBM projects, is the huge variety in structure. The tempo is tempered, though varied, with a speed balancing in between very slow up to mid-tempo. No blasting eruptions here, with exception of the grandiose interludes in The Chains Are So Beautiful or some fragments in the thrash-rocker Inside. But despite the decelerated speed, you can’t expect a lack of heaviness. Everything indeed sounds pretty heavy, not of the harsh kind, yet of the overwhelming kind. The production is highly qualitative. In the mix, you can hear every instrument in a nice symbiosis. Because of the progressive execution, the drum patterns and the (few) avantgarde string riffs (electric, semi-acoustic, acoustic and bass guitars) come to their righteous elegance for sure.